We have neighbors that started their (illegal) fireworks in June. It’s gonna be a long week. I don’t think we’ll go see the fireworks this year. With week-long booms and it being Tyler’s first 4th without his sister to hide under the bed with, I just don’t really want to be gone- especially until he gets his echocardiogram. For those of you with pets here are the top 10 4th of July safety tips. Also, I posted last week about the drug for noise aversion drug Sileo. I did buy some sparklers but with my computer issues and limited time, I might not make time to play with them and my camera. My computer uses file history to back up and I used to leave another HD plugged in to do occasional full system backups but something changed with Win10 and the computer wouldn’t boot with that drive plugged in. So when I remember I plug it in and run a full back up, but it takes DAYS to run. That is an awful lot of downtime to run frequently. Not sure why it’s so darn slow. I’m not a fan of iMacs but I really do admire their seamless TimeMachine backups. Shame windows doesn’t have something that works that well. I may take apart an old computer and see if I can figure out how to add the HD and RAM from it to the one I’m using now. How hard can it be? 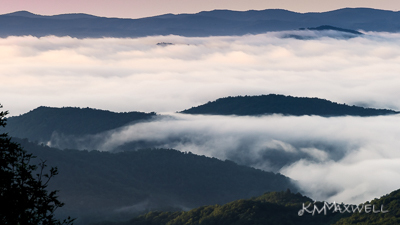 Up at 4am to be up on the Blue Ridge Parkway by sunrise was well worth it. My friend and fellow photographer June, went with me. 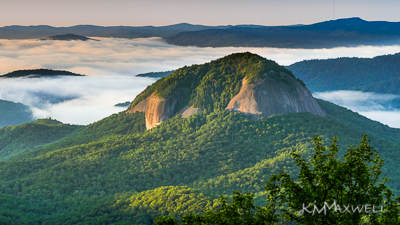 I’ve been to two other sunrises up there so I wanted to get to a new overlook. The foggy drive up the parkway had me running a little late and we started to see the sky lighting up and decided on an East Fork Overlook which was not on my list, but a beautiful find. Funny thing, as soon as we pulled into the overlook several cars pulled in behind us and we recognized a few people from the camera club. On the drive to the overlook I spotted a raccoon scurrying along the road trying to run without letting go of whatever it was holding with its front feet, sadly I had no time for a photo. I tried my new variable ND filter stacked with my half grad ND filter. I was a little concerned about making the “x” I read about but didn’t see it in my final images. I wanted to light paint the bushes closest to us but I neglected to check the flashlight’s batteries – which were dead. Oddly enough those bushes were lighter in the photos anyway even though I have no explanation as to why. We snapped away and the other group left, I overheard they were going to Looking Glass overlook as soon as the sun peaked over the horizon. I wanted to use my solar filter so we stayed long enough for me to get a few shots of the sun then we went to an overlook near Looking Glass where we had a view of it without feeling like we were tagging behind following the other group. So I’ve seen three stunning parkway sunrises and I want to see lots and lots more! We went on to Skinny Dip falls hoping to be there early enough to be able to photograph the falls without swimmers… and we were. In fact, we had the whole place to ourselves except for a little mouse that ran across the walkway just at the bottom of the steps. It wasn’t even a mile hike but it seems like a pretty rocky root covered path just to swim but then again I want where I swim to have a liner and no critters swimming with me. We saw lots of galax that I had just learned the name of from Kevin Adams book. We stopped at Pisgah Inn for breakfast and were going to call it a day but last minute decided to see if the gate was open to see Slick Rock Falls. My brain left out the rutted dirt FR475B Headwaters road and I was looking for the pull off of the paved FR 475. I wasn’t driving last time when I saw it in winter, which must have been before I started this blog because I have no photo. I might add a waterfall album at some point even if they don’t all get a description. This is one short walk to the falls if you don’t like trecking through the woods. So all of that done by probably 11am. The early bird really does have a longer day even if all they want to do is take a nap! Just to show I don’t think clearly without my pot of coffee in the mornings… I carried my lens ball around to each stop with me, saw it various times getting filters out but never remembered to take it out for a photo. Nothing like carrying the extra weight around for no good reason. Skip ahead a few days and since I hadn’t worked on this post yet I decided to combine them both. Off to school I went. Well, Schoolhouse Falls that is. The bugs were horrible despite the dousing of bug spray. This trail changed quite a bit. It started as being a major root covered trip hazard, then turned into a path lined with tons of ferns. We past prints in the mud but didn’t see any animals. Made a mental note to see the difference in animal prints for future knowledge. There was one large tree that had fallen over the path the really didn’t look like it had much more than a side branch holding it above our heads so we walked under it quickly. I don’t know what struck me so much about this waterfall but I really think it has to be in my top ten. So pretty. Even though there was a tent behind us, some trash including food wrappers in the rocks and a ringneck snake startled me, this is one pretty waterfall. Adams book said you could go behind it but since I’m still guarded with my shoulder and falling we just enjoyed it from the front. I think this is one I’d like to see in other seasons. I had never heard of or seen a ringneck snake until the last year and now between hubby and me, we’ve seen three. How I do wish my optometrist could’ve measured and made my progressive lenses so I could see the ground, where I’m walking, what I’m photographing AND my camera without taking my glasses on and off because that snake was just a brown blur at my feet with my glasses off to use my camera. I didn’t plan this one out as far as looking to see what was near it before going. When I got a little bit of a signal on my cell I discovered Warden Falls wasn’t too far. We got to the top of the falls and it sounded powerful. We hiked down through, over and under the rhododendron and laurels to discover that it was too much of a scramble to get to the base for me right now with my shoulder. Any other time and I wouldn’t have hesitated but at the base the area where you go down the bank has a lot of slippery rock and would require holding on to the trees to go down, then pulling yourself up to get back and after all my shoulder surgery cost, and how slowly it is healing I thought it was too risky. Note to self to read more before taking off. The walk back to the car seemed really really uphill. I’m not sure how far we really walked. It was a 2.4 mile hike to just Schoolhouse and back and Warden Falls says it is a 1.68 mile one way but I’m guessing some of that mileage is covered twice at least until you get to Devils Elbow trail. I really want to learn if a Fitbit can track distance by milage in the middle of the woods where cells don’t work, like to know when you’ve gone 1/10 of a mile and need to take a trail? and do they show a map like map my hike so you can find your way back if you get lost all w.o constant cell service or do you need a dedicated GPS that works off satellite? I asked on Facebook but no one answered. If you know please chime in. This was not as high of an elevation as I try to hit in summer and whenever we came to a clearing I could really feel the heat. At least I can enjoy the air conditioning while I cull and edit. I shot most of these bracketed and as usual seem to take way too many photos! I’m not sure if you’re aware but the policy has changed on YouTube and you have to have a whole lotta followers and likes to access some of the features so I’d really appreciate both. My uploads will often be about cats, book covers, photography and Western NC and of course, you can click to follow this blog too- over there on the right. 7-7-18 adding to this post with a few of my sparkler pics. We didn’t go see the fireworks BUT I did play with sparklers and my camera for the first time. My idea of a sparkler in a ball jar instead of lightning bugs didn’t really work as expected so I caught some bugs and combined several shots because the little buggers quit shining showing off their glow butts. For the writing, I wrote those backwards with my camera on a timer while I ran back and forth and hubby was inside with Tyler. For the big circles, I asked if hubby would help me and it was meant with “do I have to put on shoes” and “if I get mosquito bit I’m going in”. I guess I do ask quite a bit from him and all my photography experiments. for the smaller circle with my flashlight sqiuggles, I only taped one box of sparklers to a string. For the bigger circle with sparks flying everywhere, it was two boxes.